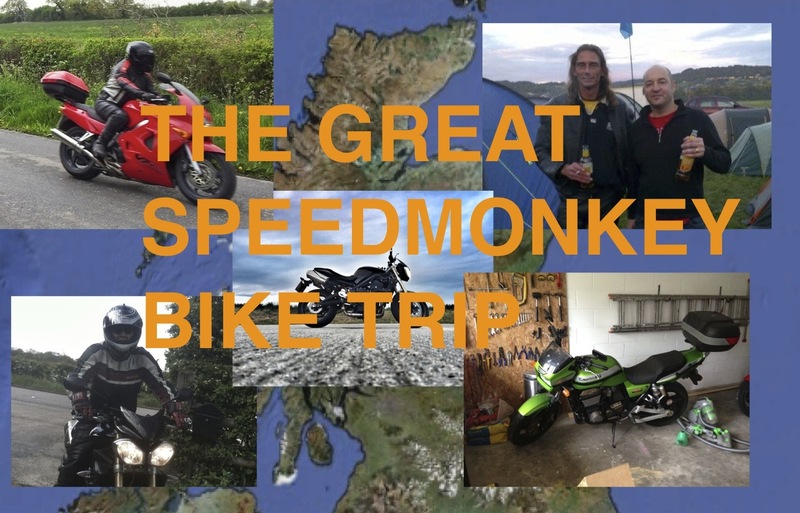 On 19 July four of us will set off on a four day trip on motorcycles on a tour of Scotland. I'll have ridden 180 miles the night before to reach the start point in Northwich, Cheshire. The three will be: Colin, a regular Speedmonkey writer who also happens to be my brother, on a Honda VFR 800i, Robin on a Kawasaki ZRX 1200, Nick on a Harley Davidson 883 Iron and me (Matt) on a Triumph Street Triple. It's a huge trip which Google Maps reckons will be 907 miles (plus my 360 miles to get from home and back to Northwich). Colin and Nick ride every day but Robin and I less so. In the 18 months I've owned the Triumph it's done 3000 miles. It's fair to say I'm not bike fit. I've been squeezing in the odd 50 mile trip here and there, and have given the Triumph a fettle and damn good clean. Before the trip I need to fit a new rear tyre. None of us are exactly spring chickens. The trip was organised to celebrate Colin's 40th birthday, and it's Robin's 40th the day before we set off. I'm a couple of years ahead of them. Colin and Robin have massive luggage boxes attached to their bikes. I've ordered a Renntec luggage rack onto which I'll strap a rucksack. We're not completely mad - we'll be staying in B and Bs rather than camping. So, just over a month to go. Wish us luck and if there are any particularly spectacular roads on the route please let me know. I'll be putting in a few short trips beforehand to at least try and get myself ready. The longest single trip I've ever done on a bike was Berkshire to Heysham, Lancashire to catch the ferry to the Isle of Man, and that was in 2009. I do get the feeling I'll be like a marathon runner whose only preparation for the marathon has been a few sprints round the block.